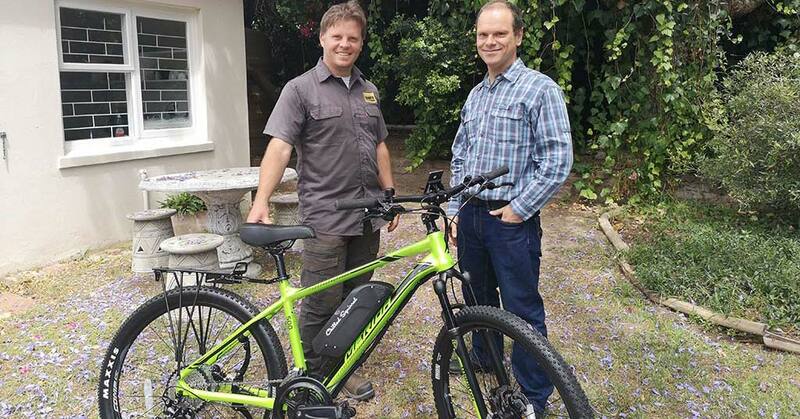 Gnu World recently donated an electric mountain bicycle to Tokai Mountainbike Central (TokaiMTB). TokaiMTB is a volunteer-run initiative focused on boosting personal safety and security in Tokai Park and on the Tokai bike trails. The Tokai Section of the Table Mountain National Park has seen its fair share of incidents. There was a horrific fire in 2015, and a number of attacks riders and hikers have occurred. Thanks to local voluntary groups, including NPO TokaiMTB, the park is now much safer. With the support of South African National Parks (SANParks), TokaiMTB has focused on reducing criminal activity and ensuring emergencies are attended to as quickly as possible in the park. In 2016, TokaiMTB set up an emergency contact number. This led to a significant reduction in the response time to incidents in the area. Deon de Villiers, Table Mountain National Park liaison of TokaiMTB, says that although there were other emergency contact numbers already available, they were routed to a centralised call centre. Often this caused delays in dispatching an emergency team that knew the layout of the Park and was close enough to where the call came from. Also, the group and SANParks honorary rangers recently began regular patrols of the Park and its seven hotspots, during the week and on weekends. Park users can easily identify the marshals by their branded clothing and high-visibility vests, says de Villiers. TokaiMTB is a member of the Table Mountain Security Action Group. The group has helped organise hikes and climbs throughout the year, bringing SANParks, private security and civic society together to work for park users’ safety. The Table Mountain Security Action Group is about to do a silent launch of a personal safety programme for park users. “We have to keep the details of the technology we’ve helped test for the initiative under wraps – to ensure the safety and efficacy of the system – but all tests so far have been highly successful in showing how we can further reduce the time between incident and alert, to get the message out to available first responders.” says de Villiers. The donated electric mountain bicycle will mainly be used for security and maintenance patrols on the Tokai bike trails. But the bike will also do much to help solve the accessibility issue that arises in an emergency in the Park. “As much as one can reduce the response time to an emergency, there’s also a rate to how quickly an emergency can be attended to,” says de Villiers. Motorised vehicles are limited in which parts of the park they can access, and in how fast they can travel. The e-bike provides the perfect solution. It will make it possible to reach anyone injured or in danger quickly, especially in the hard-to-reach areas of Tokai Park. The e-bike will also play a key role in the rehabilitation of one of the other key players in TokaiMTB’s work, Mark Smith, Guest Relations of TokaiMTB. In January, Smith fell ill with a life-threatening kidney condition. An operation saved his life. The e-bike will assist him in regaining his fitness, enabling him to get out the house and onto the mountain more often.